Nuovo sistema di climatizzazione mini split appena installato per rendere perfetta la tua esperienza di raffreddamento Kuhio Shores 415. Aprire finestre, alisei e ventilatori per ascoltare i suoni rilassanti dell'oceano. E ora, se nessuno dei suddetti lavori, utilizzi un sistema di aria condizionata silenzioso ed efficiente per rendere il tuo soggiorno il più confortevole possibile. Controllando il nostro condominio di fronte all'oceano Mike Galvin vedrete che è a meno di 50 piedi dal bordo dell'acqua, questo condominio di fronte all'oceano Poipu al quarto piano ha una vista senza ostacoli di tramonti, balene, tartarughe, delfini, navi da crociera, surfisti e altre attività marine. Situato nella zona soleggiata Poipu a pochi passi da una splendida spiaggia di snorkeling e uno dei migliori ristoranti dell'isola. A pochi passi di altri eccellenti spiagge nuoto, pesca e visite turistiche. Questa una camera da letto, un bagno, 850 condominio per le vacanze metri quadrati può ospitare fino a quattro persone. Le caratteristiche includono telefoni, wireless DSL, 32 e 24 pollici a schermo piatto, videoregistratore, lettore CD / nastro, stereo, cucina completamente attrezzata con forno a microonde, lavastoviglie, accogliente veranda e posto auto. Si tratta di un condominio non-fumatori. 'Negli ultimi 15 anni abbiamo fatto Poipu una delle nostre tappe più frequenti. Da tutte le misure il vostro condominio Kuhio Shores è stato il migliore! Grazie Galvins per un immacolato attraente casa dieci giorni. Ci torneremo e probabilmente inviamo alcuni amici in questo modo '. 'La tua casa è stata mai così rilassante e confortevole. Abbiamo visto le tartarughe, un sigillo e surfisti che si divertono. Apprezzato Poipu Bay così tanto. Non importa dove siete in questa sala si può vedere il bellissimo mare '. 'Come sempre Kauai ci ha dato il suo meglio: persone deliziose e cordiali, tanto sole, un paio di docce a pioggia, un sacco di surfisti appena al largo della costa qui al condominio, un sacco di shopping meraviglioso, ottimo cibo e, ultimo ma non meno importante, bellissime camere! " We rented Kuhio Shores unit 415 in January 2019. I was somewhat sceptical as to what I saw of the pictures on the accommodations would match to reality. The pictures were totally accurate. The unit was very clean and comfortable, and the location was so exceptional. Mike Gavin, the owner, was enjoyable and trustworthy and a pleasure to deal with. The lanai was private, and the ocean view unmatched, and the viewing of both sunrises and sunsets from the lanai was what we dreamed for. We spent more time than expected at the condo because we felt that there was no other place we would rather be. Listening to the waves crashing the shore, the wonderful view of the night sky and stars, watching sunrises and sunset. Watching sea turtles and surfers in the ocean directly in front of the unit. Walking the shorelines from the condo was very enjoyable. It was just so relaxing, comfortable and enjoyable. We will return again, and will look forward to it. Totally recommend this condo rental. This property is the finest vacation rental condo we've ever enjoyed. The location - just outside the "tourist zone" of Poipu, adjacent to Lawai Beach and community parks, and within walking distance to ample shopping, couldn't be better. All the amenities very nearby without the traffic and crowds associated with busy tourist zones. Everything in the condo feels brand new including all of the appliances, furniture and amenities and linens. The owner graciously provides ample beach goodies including towels, coolers, ice packs, chairs, umbrellas, and boogie boards to suit anyones needs. We truly needed to bring nothing but our clothes, food and drink. The 4th floor condo has an unparalleled 180 degree view of the ocean from the sunrise over Poipu in the morning to the sunset over Waimea every evening. The complex has a wonderful lawn adjacent to the ocean sea wall and shares and easy walking path with the first rate Beach House restaurant. Every evening was spent on this lawn, with drink in hand, watching the sun spectacularly set. We made use of the two on site barbeques as well as the onsite shared laundry facilities. There is ample parking - although beware of the nightly parakeet migration and the mess they can bring with them roosting in the parking lot trees for the night. Great trades winds cool the condo with the front and backdoors open. Truly outstanding and we look forward to a return visit, sooner than later! If you want an inviting and well-appointed place to stay in the Poipu region, with a spectacular location right on the edge of the dramatic Kauai shoreline, Kuhio Shores #415 is the condo of your dreams. Here you are: four stories above the surf tumbling over lava rocks, watching green sea turtles wave-bobbing below and surfers shredding rolling waves from sunup to twilight. 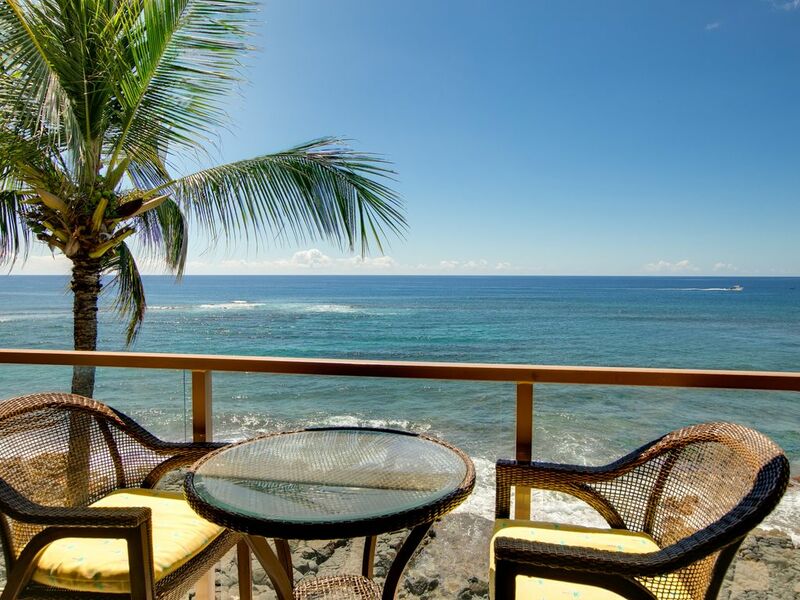 Located near the southernmost point of Kauai, the condo is an ideal place to take in both sunrises and sunsets from its lanai. And the comforting, soothing white-noise-rhythm of incoming waves over the rocks provides an all-night serenade while you sleep. This condo is appointed with excellent furnishings and touches — including air conditioning — and a full kitchen with an impressive array of cooking utensils and gadgets. It's close to restaurants, shopping and scenery, including two of Kauai's three renowned National Tropical Botanical Gardens, Allerton and McBryde, a mile away, plus sandy Poipu beaches and snorkeling. And right next door is the famed Beach House Restaurant. All this makes Kuhio Shores #415 the place to call your headquarters for a South Shore visit. This condo is delightful, comfy and convenient, and is maintained with high quality by owners Mike and Sue. We have been staying at Mike's condo at Kuhio Shores for over 15 years, simply because it is the best place to stay due to the Aloha warmth, details, comforts of home...and of course the location! You are blessed with an amazing oceanfront location, that will mesmerize you. One of our favorite things to do, was simply enjoy our coffee or dinner on the balcony and watch the surfers and sea turtles, which would entertain us for hours. Falling asleep to the sound of the ocean each night is incredible. Mike is always a gracious host, and the condo is WELL appointed and very comfortable with nice Hawaiian touches. We can't wait to return....again!! We were blessed to find this wonderful condo in Poipu and the owners Mike and Sue were helpful and kind. This condo had everything needed to feel like you were home . The furnishings were comfortable although we spent the majority of our time out on the lanai if we were at "home". My husband made good use of the BBQs, we cooked most meals ourselves. The sunsets here were nothing short of breathtaking . We watched turtles in the morning and dolphins swimming past. Not to mention the waves. My husband snorkelled with so many turtles. Everything was perfect here and our first trip to Kauai will not be our last. From the mountains and valleys of the na Pali coast to the beaches Poipu area and everything in between this is truly paradise !